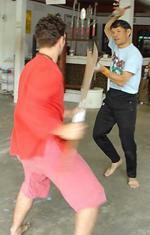 Flashes of steel the clank of metal, blades blazing like fire: This is a practice session for Kru Pedro Villalobos and his trainer, Adjarn, a Thai sword master of Krabi Krabong, the Thai art of stick and sword fighting. Sadly Adjarn is one of the last sword masters. 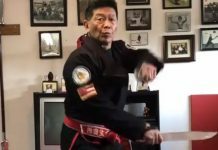 “If I do not block, he will definitely hit me.” Says Kru Pedro Villaobos, the founder of the school of Muay Thai Sangha, a religious form of Muay Thai Boran, in Chiang Mai. 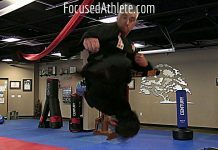 For years, Kru Pedro traveled around Thailand, finding and training with the best masters for the various forms of Muay Thai, Muay Thai Boran, and Krabi Krabong. While professional, sport Muay Thai slowly drives all other historical and artistic forms of Muay Thai into extinction, Krabi Krabong is quickly disappearing. Many of the teachers don’t take new students. Some don’t take any at all. The Adjarn is considered to be one of the last great masters. He hadn’t accepted any students in years, but after seeing Pedros diligence and extreme desire to learn, he agreed to take him on, as his last student. The two men fought, with one, real, heavy metal sword in each hand, swinging, blocking, advancing and retreating for a half hour. By the end of the session, Pedro, who is in world-class physical condition, was dripping sweat. The Adjarn looked barely winded, which is amazing, considering his age of around sixty. 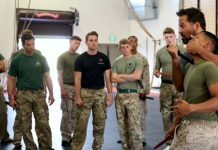 In a rare interview, the Adjarn imparted the wisdom gained from a lifetime of studying the sword. 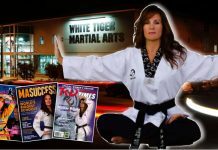 “Real fighters have to use their intellect. They approach each other not just for show. 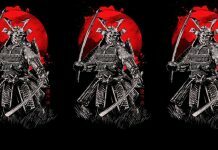 You have to practice your sword techniques on your partner. Know when he advances and know when to parry. He goes for your head, you go for his leg. Each person has their own gracefulness.” Here, the Adjarn was talking about how we all have our own style and ability. I didn’t even begin to believe I was worthy of studying with Pedro’s Adjarn. But I wanted to get a taste of Krabi Krabong, so I traveled to Surin province, where I took some lessons with Adjarn Sak Chai, a trainer of Khmer movie fighters. 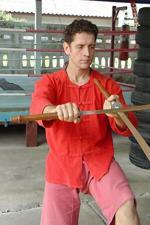 He is an expert of Muay Thai Boran, Krabi Krabong, and gymnastics, all aimed at performing in Thai action cinema. The Adjan taught me some techniques from Krabi Krabong, the Thai art of double sword and stick fighting. 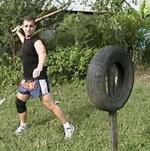 He practices by attacking a tire, mounted on a wooden pole, which serves as a wooden man. 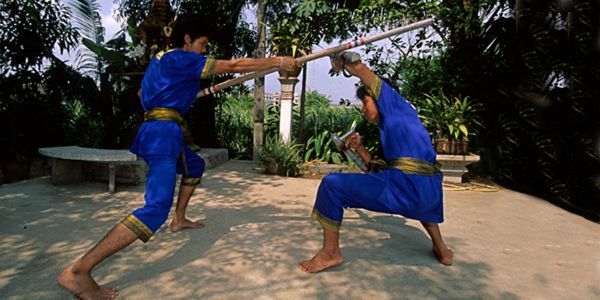 The long stick is similar to bo the staff used in other martial arts, but it is very heavy, not flexible like the ones at Shaolin Temple. 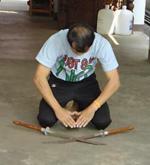 Often, the Adjan took the long staff by the end and swung it like a baseball bat. The short sticks were heavier and longer than Arnis sticks. The important thing to remember here, is that they aren’t sticks at all. 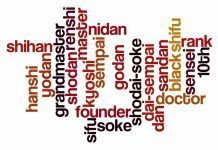 They are swords. If you were a master of Arnis you probably couldn’t apply your skills to these longer, heavier weapons. The Adjan taught me a basic patter; strike to the left shoulder, strike to right shoulder, strike to the top of the head. When you swing the sword in Krabi Krabong, you have to get a real wind up swing, twisting your body and reaching far back behind you. Then you let it fly and the weapon cuts your opponent in half. After doing the basic three strike combo on a tire for a while, I was permitted to practice with a live partner. I attacked, stepping forward with each strike. The opponent defended, stepping back at a forty-five degree angle, blocking as he went. Then he attacked, and I retreated and blocked. We practiced again and again, until we could do the patter at speed. In rehearsing for movie fighting, we did the same, basic pattern. On film, however, you use a lot more energy and add in a great deal of shouting and snarling. It looks really mean in the cinema. But it was fake. Pedro’s Adjarn was the real deal. Pedro’s Adjard said. “Bang! Boom! Pssshhh! The best and fastest one would win! This is the real fighting. Today, fighting is all a big show. It’s not real, only exercise and theatre. We must attempt, now, to preserve the old sword fighting methods, not just make a show of it, practice the real way. You must be serious and not slap each other with the blades like if it were a game. You must practice with all your heart and devote your time to it like it was your life, as the old practitioners did. If some one wants to come study with me, I must first examine their behavior and dedication. Otherwise, they will waste their time and mine. This style is mostly one of defense and not offense.